The English poet grew up in Hampshire and now lives in London. Her first full collection The Observances was published by Carcanet/Oxford Poets. The cover is a detail from ‘Neither White Nor Warm nor Cold’ by Christopher Le Brun. The Observances was shortlisted for the 2015 Costa Book Award for Poetry, and the Seamus Heaney Centre Prize for First Collection, which was awarded to Kate on 30 June 2016 in Belfast. She travels to New York University in November to meet the Irish-American patrons of the prize and read at the Tom Quinlan Lecture. In 2012 she completed her PhD while teaching Poetry (modern and historical) courses in the English department at Goldsmiths, University of London. She contributes workshop ideas, close reading prompts and feedback to Poetry classes at Poetry School, Poets’ House Oxford and to schools. She was awarded the Edwin Morgan International Poetry Prize in 2008 and has received a number of other awards. Selected for Best British Poetry 2011 (Salt) and in 2013 and in the 2015 anthology, the Forward Book of Poetry, Kate’s poems have recently been seen in Ambit, Long Poem Magazine, New Walk, Poetry Review, The Rialto, Shearsman, Warwick Review, and the TLS. 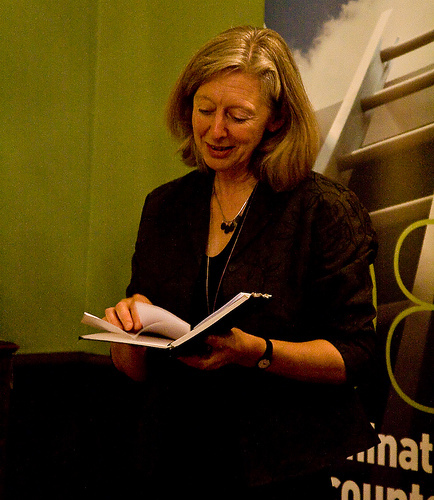 For some years Kate co-hosted readings and events with members of the Southwark Stanza of the Poetry Society and is a member of the 12 strong ensemble which performs the collage-poem, Impossible House. The next performance is on 4 October at Beyond Words. She accepts invitations to read at libraries, bookshops and various watering holes, including at the inaugural Open Weekend for The Guardian in 2012. She is appearing this Autumn at the Winchester and Aldeburgh Poetry weekends and will be guest poet at the new series of Talking Rhythm at the Prince of Greenwich pub on 28 September. Contact Kate to invite her to read her own work or talk about poetry of the English-speaking world.